Kennewick police say that a man who was street-racing with his own son at extremely high speeds when he struck and killed a pedestrian who was crossing the street. The driver, identified as Michael S. Johnson, was jailed on Thursday on suspicion of vehicular homicide. 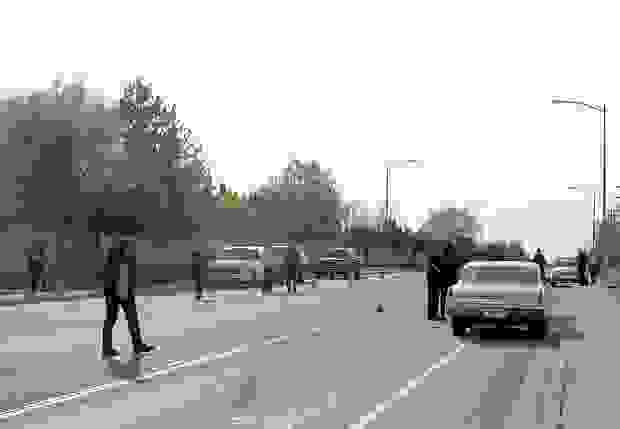 The collision occurred in a speed zone of 40mph in Kennewick, though police records show he was traveling at approximately 72 mph. The two vehicles were reportedly racing on West 27th Avenue in Kennewick. Johnson reported to officials he did not know how fast he was driving because his speedometer was broken. KEPR-TV News reported the pedestrian was jaywalking at the time of the collision. But there was no time for the pedestrian to react because of how fast Johnson’s vehicle was traveling. Officials spoke with witnesses at the scene and after analyzing the skid marks on the road, “The collision would not have occurred had (Johnson) been traveling more slowly as he would have been able to stop prior to hitting Ms. Howard,” Kennewick police stated. The road in which this collision occurred on has two eastbound lanes and one westbound lane. The pedestrian was not using the crosswalk when the accident happened. Howard, 52, was pronounced dead at the scene. Johnson was arrested and taken to the Benton County jail for multiple days following the collision. He then was released with no charges as police continued with their investigation into the collision. On Thursday, however, prosecutors filed vehicular homicide charges against Johnson for driving in a reckless manner and or with disregard for the safety of others. When it comes to pursuing a wrongful death claim specifically for a pedestrian collision, it can sometimes be difficult to place liability for a collision on the driver of the pedestrian was not in a crosswalk at the time. In this particular instance, police have reportedly stated that they believe Howard was not in a crosswalk at the time of the collision. However, police have also publicly stated that they believe Howard would have been able to avoid the collision if Johnson had been traveling at the 40 mph speed limit. This is an important piece of information for the family of the victim to consider, especially if they are interested in pursuing a wrongful death claim on behalf of the victim. If there is enough evidence to place the fault on the driver, then the chances of a successful outcome of the case are much higher.